High-frequency magnetic impulse cavitation reactors work successfully and steadily with both raw and purified oil, and with all types of animal fats and fat mixtures with vegetable oils. This wide range of oils (sunflower oil, rapeseed oil, linseed oil, palm oil, mustard oil etc.) can be used for biodiesel fuel production with almost any acid number and it is also possible to use waste from livestock and poultry processing plants. The equipment does not need to be adjusted when the type of oil is changed. Unlike in outdated “tank” technologies, no re-etherification reaction is needed in magnetic impulse cavitation technology. This innovation means that the time taken to obtain biodiesel is reduced by a factor of 8-10. When using conventional technologies, it is not possible to obtain proper quality biodiesel fuel immediately. Therefore a process of impurity elimination, involving washing or purifying using sorbates, is needed. This requires additional equipment for primary biodiesel product washing (a mixture of water and alcohol is usually used for this purpose) and additional units for what is known as vacuum drying. When the cavitation biodiesel manufacture method is used there is no need for the finished product to be washed or dried, and this therefore eliminates waste water and sorbate utilization processes. One of the main problems with “tank” technologies is the need to add, and consequently to recover, additional methanol to the reactor. This requires additional equipment and wastes electric power. 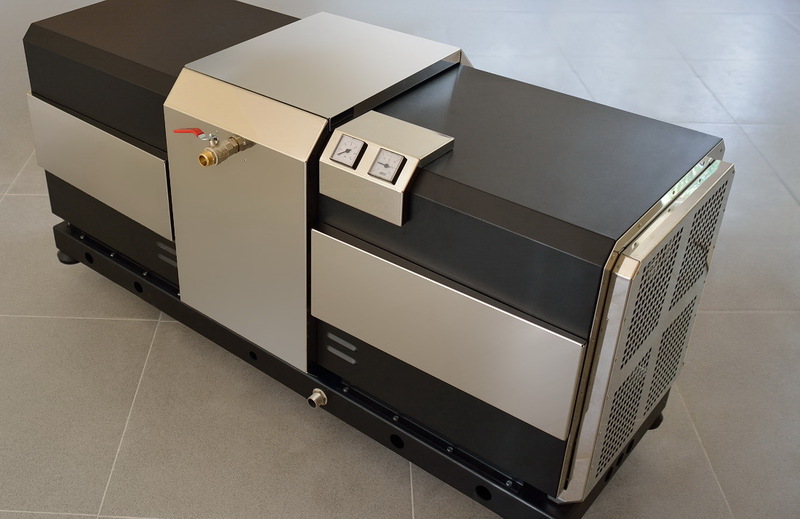 In cavitation technology, the alcohol quantity used for the reaction conforms precisely to the stochiometric composition, i.e. the minimum volume. There is no need for a re-etherification reaction. The use of expensive and dangerous equipment for methanol recuperation is excluded from the process. Any inevitable alcohol losses during recovery are eliminated, which improves the environmental conditions and explosion-proof characteristics. Conventional biodiesel production methods are based on heating the oil to 67-70 °C. This involves significant electric power costs; in addition, the methanol recovery process (required when the reaction is carried out using conventional technologies), additional re-etherification and also vacuum dehydrating lead to considerable electric power consumption. The use of cavitation processing eliminates all the stages mentioned above, which means that 5-7 times less electric power is used. In high-frequency magnetic impulse cavitation, processing takes place in the reactor on molecular level. All components are exposed to magnetic-directed cavitation pulses. Fatty acid molecules are split using micro-explosions; this results in a decrease of viscosity, a cetane number increase, an improvement in the energetic parameters of the future fuel and a considerable acceleration and improvement of the etherification reaction quality. It must be noted that the reaction takes place at room temperature and there is no need to heat the oil. Biodiesel derived from animal fat (waste from the processing of livestock) using the cavitation reactor PULSAR-CT. Animal fat was first liquefied (heated up to 60°C). 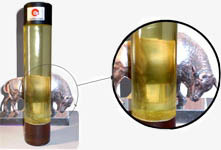 The picture shows the source oil (crude non-refined sunflower oil) and the result of source product treatment in the cavitation reactor PULSAR-CT.